I clipped our pink peonies this morning. This variety is called Shirley Temple, whose description promised large flowers (up to 8 inches). I of course loved the promise of such large blossoms, but I also liked the name because it reminded me of my Mom who loved Shirley Temple movies. This is the first summer that the blossoms have been this large. They continued to open after they were cut and in water for the afternoon. I really love the yellow centers. My gracious assistant agreed to hold the large bouquet for me. He likes peonies. They require no maintenance whatsoever. The roses on the other hand, he doesn't care for (and that's putting it mildly) because they are constantly having to be treated for bugs or diseases, only to be served up as an evening snack for the deer. 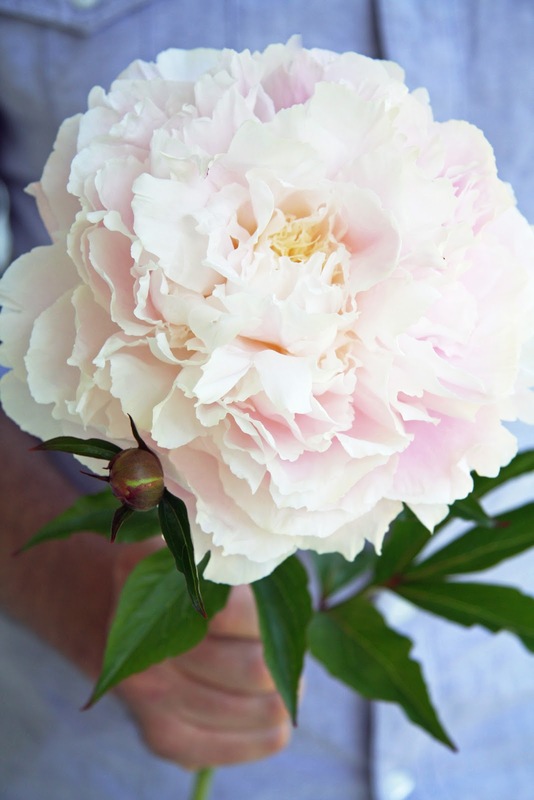 Love peonies and yours are such a pretty shade of pink. Now, if they just did not have those darned ants! How gorgeous they are! Thank-you for sharing so many lovely blossoms from your garden. wow they are huge not sure i ever seen 1 so large......what is the white fower showing in 1st & 2nd pic ? they look interesting. Those peonies are amazing. They look like they come from a happy home. I'm with your assistant on the roses, even though I don't have a deer problem. They only look great for about a week. I'm thinking of getting rid of most of mine. Gorgeous. Truly a gift from nature. I think I spy some lavender in front of the peony? Fabulous. Those are some crazy large blooms indeed, very cool. We were lucky enough to buy a house that had been previously occupied by a peony lover and have several varieties throughout the yard. I wasn't too familiar with them, but have come also appreciate their low maintenance qualities and impressive flowers that require very little work on my part. So beautiful . . . I like Shirley Temple Peonies . . . I discovered something by accident when I clipped the peonies. I left them in their vase out on the porch all day and when I took them out to photograph them, I realized that all of the ants were swimming in the vase water. I poured it out and refilled the vase with fresh water and haven't seen one tiny ant on our dining room table! I wish I knew what that white flower was! It's a lovely flowering plant but I have not been able to find the tag. So I'll have to research that one. I too would have picked them just because of the name. It seems to make the peonies that much more fun. They are spectacular, and I love the way they blush their pretty pink tone along the white picket fence. Your peonies are beautiful! They are my favorite. I love them in the old blue mason jars. 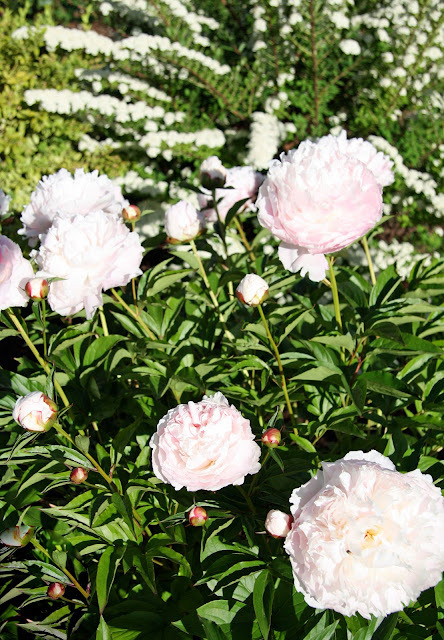 Your peonies are beautiful! They are my all-time favorite. I love to clip mine and place them in old blue mason jars. WOW! Stunning photos! Peonies are my favourite flowers!! I'm so jealous you have peonies. I was just thinking today, that they are one of my top flowers. Are they easy to grow? Trina, they look lovely. Makes me sad, ours are long gone. Enjoy them. They are a gift! Just beautiful. My favorite flower, the peonie. Do they smell divine? I love the fluffy fullness of peonies....beautiful. Your peonies and gardens are beautiful! My "white" garden has white peonies, rose of sharon, lupines and little lamb hydrangeas ~ it's such a relaxing view. It's a very old-fashioned looking garden, my husbands aunt used to have a white garden, I got the idea from her! Are the white flowers Spirea (May bush)? I can't see them up close on the photo well. It's a lovely bush if it is. 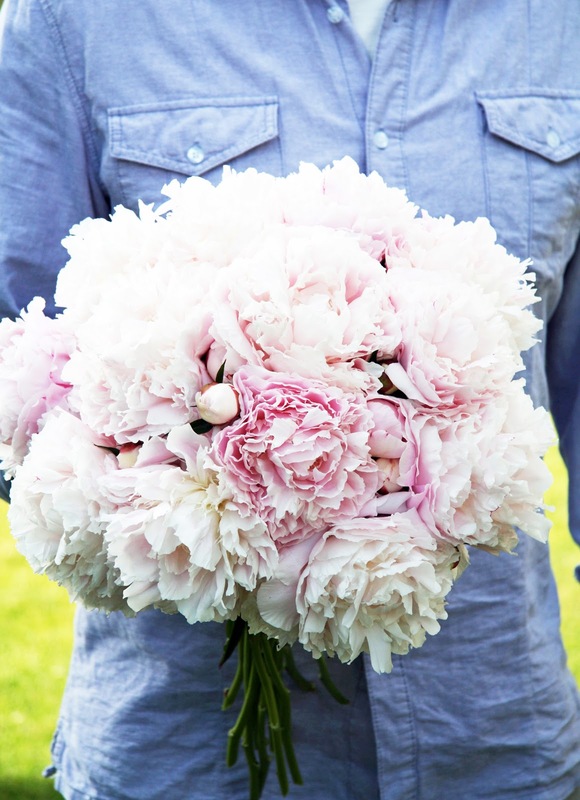 I adore your peonies! Here in New England my peonies have already left us for the summer after a few torrential rainstorms - yours are beautiful, in love with this variety! I am so jealous of your beautiful peonies. My favorites and those are gorgeous! Here in N Texas they bloom in early May. Mine are long since gone! So beautiful and the color is lovely. I can almost smell the delicious scent! Lillian, Yes, it's Spirea! Thank you so much! So, so beautiful! My favorite flower. These are beautiful, I especially love the look of the large boquet. I purchased the Madame Emile Lemoine Peony(white with red flecks) Next year I may just have to find this Shirly Temple Peonie; she was also my favorite I still watch her movies! Beautiful. Would make a lovely bridal bouquet. I understand what you say about roses: they are labor intensive. The peonies are absolutely stunning! love peonies, i think they are one of the most gorgeous flowers. Did you do any decorating from this fathers day weekend? I love Peonies they are my favourite. Unfortunatley it is too hot in Queenland Australia to grow them here so I scoup them up at the flower market when every they come in. Love peonies! They were in my wedding bouquet. It's nice to hear they are so low maintenance--I will have to plant some. Adore your blog. You have made such a beautiful home and life for yourself! 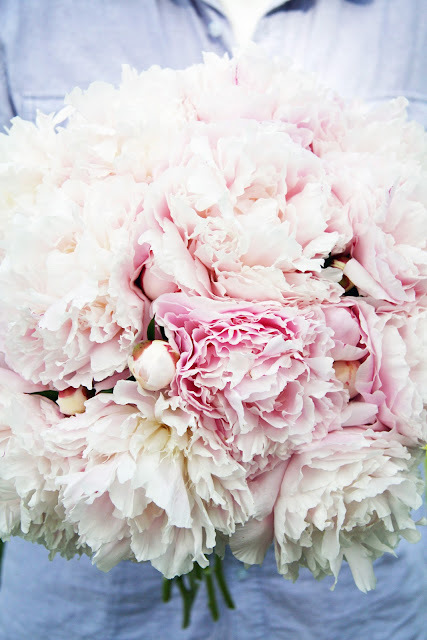 We love peonies! Your yard is beutiful. Found your site while looking at kitchens as we are in the middle of remodeling our 1800 kitchen too! Those blooms are HUGE! I can almost smell them from here. I'm so jealous that you have these right in your yard! I was just in Aspen for a few days and there were peonies everywhere- we can't grow them down here in Florida so I was so captivated by them! I wish I had a yard full. My one peony bush blooms early spring then is gone but I love it while it's here. Your assistant does a good job! Hubby and I got married on the beach 8 years ago this month... my bouquet was a big cluster of peonies just like you are holding. They hold a special place in my heart. 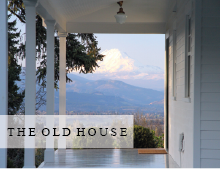 When we bought our lot, we took about 10 months to design the new house before we tore down the old house. The woman who had lived there was a widow, and had some pretty flowers - including peonies. We tried to save them, but they did not do well with the construction environment! For one year we had nice bouquets of peonies - I don't think I appreciated them enough! 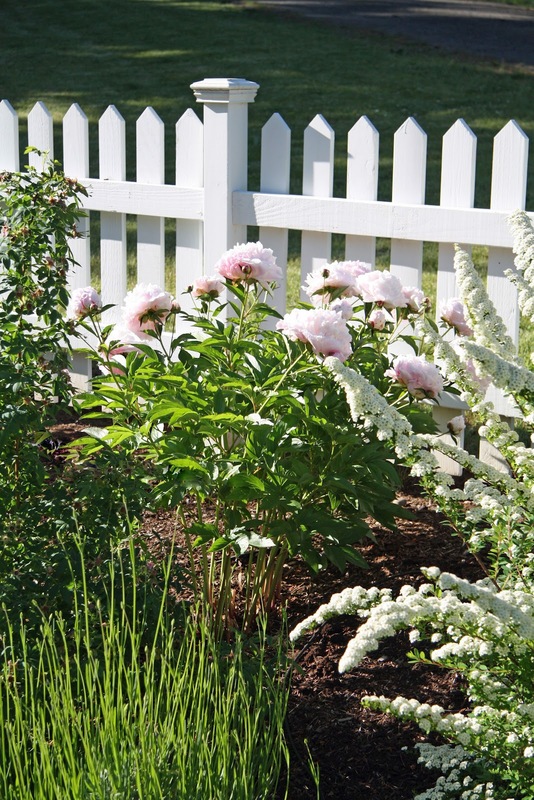 What is the elongated, white flowering bush that can be seen in the picture with the peony? That's really pretty too! Garden looks wonderful! Taking notes for our place when landscaping is what we're doing! Just found my answer in your previous posts! Thanks anyway! Hi Catherine! May I ask what you use to treat your roses for pests and diseases? I just planted some roses, and realize they have some pesky bugs and such on them - can you tell me how you or your husband care for them? Sprays? In soil pesticides? When to apply? Thanks so much! I find your blog sooo very inspiring and helpful! Hope you and your lovely family are all settled into your new place. God Bless! Honestly, we never got on top of that. We used green products from our local nursery but I can't remember their name. And we never got ahead of it. The roses always had something. Good luck!